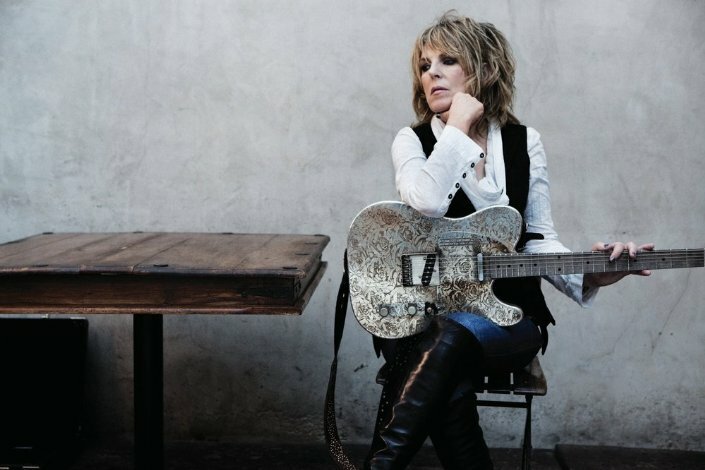 “Everybody always asks me what the theme is,” Lucinda Williams says, her drowsy Southern drawl punctuating her frustration at having this question put to her for what must be the umpteenth time. "I just go in and write the songs. And, I guess, whatever I’ve been dealing with at that time, that’s what’s going to come out." While she's at it the three-time GRAMMY® winner and wife—in 2009 Williams married Tom Overby, her longtime manager—also squashes the seemingly popular notion that she must be in a miserable state in order to write a decent song. "I mean, it’s a good idea to have experienced different things in life," she maintains, suggesting that she's contended with enough with pain and sadness should she need to glean such inspiration in the future. If there was ever any doubt, however, she's surmounted it with her tenth and latest studio album, Blessed. It's her finest work in at least a decade and, what's more, its songs are the product of a very happy woman. Your songwriting, particularly the lyrics and their imagery, could be described as raw, unvarnished, even feral. Wow, feral... I love that word. I never heard anybody describe it like that. Is that just how you perceive things? Or, when you’re writing lyrics, do you have to scrape away at an idea before you get down to the core of what you’re singing about? It’s probably just more what comes out. Well, that song, “Blue,” that song took a long time. I started that song years ago and finally finished it when I was writing the songs for Essence. That’s an older, older song that I had ideas for and just couldn’t seem to put it all together. So that song did take longer to write. Some of them are like that. And some of these [new] songs, like “Soldier’s Song,” I had the idea for quite a while back, a few years ago. The main thing for me is coming up with the idea for the song. Then I’ll sit down with it and work on it and everything. But I might just have a few lines. And some of them I’ll kind of chip away at here and there. It just depends on… I don’t know. They’re just not ready yet to be born. Are you okay with a song taking years to write or does it ever drive you nuts? Sometimes it drives me nuts. I mean, “Drunken Angel” was like that; and “Lake Charles.” That’s why I don’t throw anything away. I have a folder of scraps and pieces of paper with stuff, ideas for songs from the last 25 years; just little things, maybe early songs that I finished, but didn’t think they were good enough. But I keep everything until I’ve used the lines. I would worry if I wasn’t coming up with ideas, if I wasn’t inspired. Yeah, if I wasn’t coming up with new lines and new ideas… So I’m always thinking of stuff and writing it all down. I don’t sit down and apply myself every day, or even once a week. That just tends to happen in spurts, like when I’m getting ready to do an album. And I’ll get in that mode. Then I have to get everything out, just go through, see what comes up. And if it happens, it happens; and if it doesn’t then I just move on. Is everything fair game for you to write about? Some songwriters are reluctant to give away too much of themselves in their songs. I don’t understand that at all. I mean, if you start doing that then what’s… You’re going to limit yourself. First of all, most songwriters, all they do is write about themselves, as far as their personal relationships and unrequited love and this and that and the other. I would think it’d be the opposite challenge – to get outside of yourself…. Now that I’m at this point in my life where I’m with Tom it’s actually liberating for me to branch out and do that more. I always wanted to be able to do that more, but for me, though—and I think I can speak for most songwriters—those breakup love songs are so easy to write, as far as the inspiration and all that. One of the things my dad [poet Miller Williams] taught me about writing was, he said, never to censor yourself. And also he taught me about the economics of writing, learning how to edit. Having grown up while living with your dad in an environment that encouraged writing, how did you come to acknowledge that you had something more than an interest in writing, but rather that you had a gift? 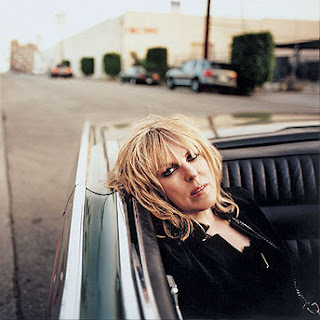 Well, to tell you the truth, I don’t think I really realized that, “Wow, I can do this,” until right before I did that album for Rough Trade Records [Lucinda Williams, 1988]. I’d been writing the songs that are on that album, and then people started recognizing; and I started getting some recognition when that album came out. That was really when—and I’d been doing it a long time before that, but—I finally went, “Wow.” I’d just been playing in bars and clubs and stuff; I hadn’t been involved in the music-business part of things. I’d just been writing songs. I mean, when I was six-years old I was writing little poems and things. I started writing songs, I guess, when I was about 13 or 14, but I didn’t know if they were good enough yet or anything. And when I was out playing, in the ‘70s and all, I had a few of my own songs, but I was still doing a lot of other people’s songs, like Bob Dylan’s and stuff, just varied things. But the Lucinda Williams album did help your confidence? “Changed the Locks” is written in a poetic scheme, though, isn’t it? Yeah, but he didn’t think that that was the way to write a song. Needless to say I was very disappointed and disillusioned. I immediately got out my Neil Young, Bob Dylan [albums] and I said, “Screw him, whatever.” And I just kept going. But I got turned down by everybody until the Rough Trade thing. So that’s why I still didn’t feel secure about my writing. Usually what people were saying around that time [too], all through the ‘70s and early, mid-‘80s when I first came out here, they would say, “You’ve got a lot of soul, but you need to work on your stage presence.” [Laughs] I was always so shy on stage. Did you ever consider being a songwriter exclusively without performing? So it was always going to be you or nothing. Yeah, because I like the feeling of singing. And when I first started out I wanted to be like—not sound like her, but—Joan Baez. Joan Baez and Bob Dylan were my two musical heroes when I was first starting out. They were involved in the whole anti-war thing and I was too when I was a teenager in the ‘60s and all that. You’ve often said that Flannery O’Connor was an early influence on your songwriting. You actually met her when you were a kid, right? Yeah, but I barely remember; I was only four…. I got introduced to her writing when I was in my teens, probably 15 or 16. That had to have shaped the way you then approached the language. I just recognized a lot of what she was writing about from growing up in Southern towns and everything. I was really drawn to that whole Southern Gothic style of writing. There was a lot of empathy in what she wrote. My dad taught me a lot about that. I was always like that from the time I can remember. I was always one of those kind of kids. Like, I remember walking home from school when I was about eight or nine, saw this little bird. I don’t know if it was wounded or dead—I don’t know—but I picked that little bird up and walked all the way home with this bird. [Laughs] I guess I buried it or something. I would always make friends with the ugly duckling in class, you know, that kind of thing. Back in '02 when you played that show, CMT Crossroads, with Elvis Costello, you half-jokingly said at one point, “I do write country songs; I just don’t write country songs that get played on country radio.” Is that something you still deal with or does it even matter anymore? It doesn’t matter anymore. I lived in Nashville for nine years. I didn’t go there to try to be a country… to try to make that happen or anything. This was after I’d lived in L.A. for six years. I had some friends who moved to Nashville and they said, “Oh, it’s cool. There’s this whole songwriting community.” John Prine was living there, and Emmylou Harris and Steve Forbert and Steve Earle. I thought, I’ll go check it out. Now Steve Earle is living in New York. You’ve got to schmooze with them? And they sit you in this little booth thing with a microphone. It’s called Fan Fair. I was sitting next to all the artists, and the fans can go up and talk to them, to you or whoever. And, of course, nobody knew who I was. So there’s nobody there. [Laughs] So, I didn’t want to get into all that; I hated it. And then nobody would cut my songs except people like Emmylou Harris and Patty Loveless. Have you ever considered writing with another great songwriter? It’s already got your stamp on it. Yeah. I can’t imagine sitting down and writing a song from scratch with somebody. When you’re playing a cover, though — you play songs like “Masters of War” and “For What it’s Worth” in your live shows — are you feeling that when you sing it? Yeah, because otherwise I wouldn’t do it. That’s the beauty of great songs. Please visit LucindaWilliams.com for more information, including upcoming tour dates. Blessed is available now, everywhere music is sold. Enjoyed the interview Donald. I remember Lucinda, at the Kerrville Folk Fest,'96, was one of the judges for the New Folk songwriter's competition. She came up to me after I played, in her black Stetson, eye-to-eye with me, said she loved my songs. I figured that was the consolation prize! It was certainly worth as much to me as being part of the Kerrville winner's circle the next day. Hearing more about her poetry, process, and present state of "blessedness" warms me. Thanks for posting this!